Carnifex is part of the deathcore scene that is inundating heavy metal these days. There are several bands that do it really well including Despised Icon and Through the Eyes of the Dead, but Carnifex are another story. 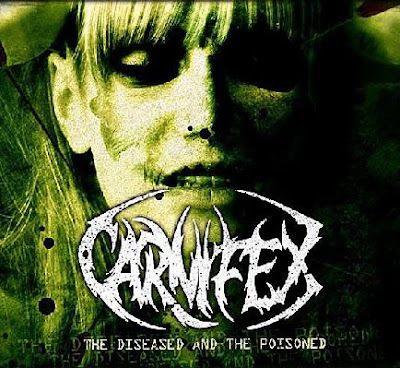 "The Diseased and the Poisoned" is just another typical deathcore album. Typical vocals, several breakdowns in every song, and they all follow the same formula. I bought this album while I bought Aborted (see below) just because it was on sale at the checkout and I wanted to see what the hype was about. Even though it is not my favorite album I own, it is one that is fun to listen to when I'm driving around town with the windows down and the stereo blasting. However, unless you are a diehard deathcore fan, this is not one I would reccommend. "Strichnine.213" is the latest from Belguim death metallers Aborted. This is the one and only album I have listened to by them because I only discovered them recently. I saw them on the Summer Slaughter Tour this summer and was blown away by their live performance. It was based on their live show that I bought this album. I must say, that it is not as amazing as I thought it would be. The album starts off with a pretty interesting intro that slowly rises in tempo with a disturbing low talking voice in the midst of the distorted guitars. From then on, the album doesn't go much further. It is an entertaining listen but it is nothing that I haven't heard before. If you already like this band, go pick it up. But if you haven't listened to them before, I reccommend picking up one of their first couple album first.